Sometimes you come across a great tool, well designed, ‘pretty’, works well, and does only those things that you need, nothing more. 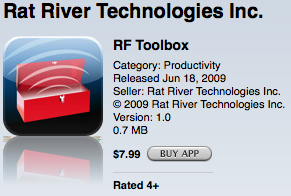 One of those tools is RF Toolbox. It will run on either an iPhone or an iPod Touch. 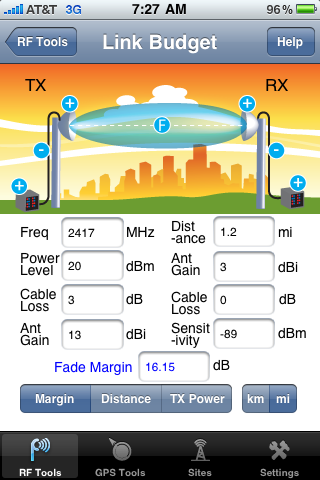 I’ve got an iPod Touch dedicated to just running tools and apps for Wireless LAN Professionals, this post will turn into a continuing review of the tools and techniques I’ve found that help in the craft. For you ‘indoor only’ kind of networking guys – this tool has parts for you. One of the calculators is for Link Budget Analysis, another that will be of use to you is the dBm/Watt Converter. The real strength of the app is in helping the ‘outdoor type’ folks with their Wireless LAN deployments. 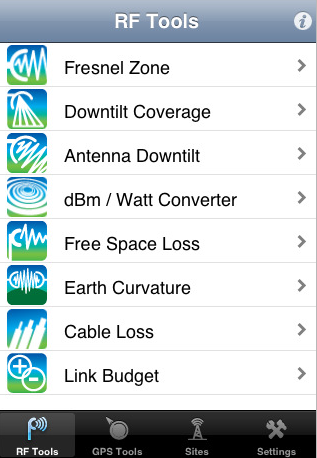 Supporting these installations are Fresnel Zone, Downtilt Coverage, Free Space Loss and other important calculators. 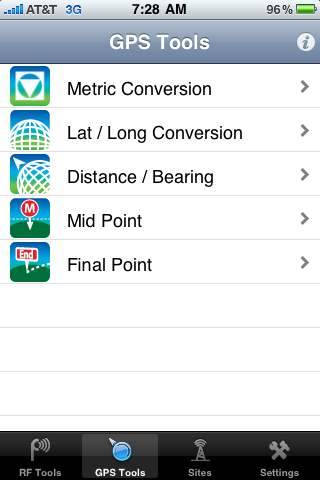 But in the GPS set I find myself using the Lat/Long Conversions most. AirMagnet Survey Pro requires it’s GPS coordinates in decimal format, and Google Earth keeps theirs in Degree, Minute, Second format – so I use this calculator to move back and forth between the two.